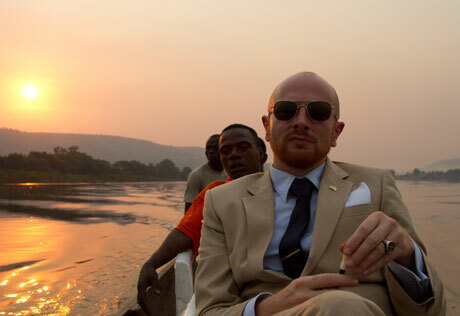 Danish director Mads Brügger goes undercover in another expose doc, this time in the Central African Republic. He tries to buy himself a diplomatic job from an unscrupulous Brit so that he can traffic in diamonds and make a mint. Brügger penetrates a sleazy world where greedy Europeans pay corrupt Africans to plunder their country's minerals. Meanwhile, everyday Africans struggle to feed themselves in one of the poorest nations on Earth. Brügger is far more subdued than in his previous film from 2006, Red Chapel, a brilliant and demented journey inside North Korea, where he accompanied a Danish-Korean comedy troupe performing for the brainwashed masses. Tall, lean and chain-smoking, Brügger resembles Hunter S. Thompson (without the drugs and guns) and possesses a deadpan wit and sharp investigative skills. There are few laughs in The Ambassador, as the film is largely told through hidden cameras capturing Brügger's meetings with a parade of dubious characters all on the take. One eerie sequence takes Brügger to the northern CAR, where he has less than two hours to drive to an open diamond site where armed soldiers oversee diamond workers, adults and children alike, toiling in the mud for shiny, little rocks. It looks like a slave plantation. Though compelling, The Ambassador loses direction towards the end. Is the corruption seducing Brügger? Is he in danger of being exposed and killed? I wish these conflicts were more pronounced.